Denver, Colorado, September 10, 2018 – BRP (TSX:DOO) once again disrupts the powersports industry by introducing the all-new Can-Am Ryker model, arguably the easiest-to-ride 3-wheel vehicle ever created, both in terms of driving and pricing. BRP enhances the riding experience for Sea-Doo and off-road riders by launching a new, specialized Sea-Doo model purpose-built for fishermen, the FISH PRO, and an all-new Can-Am Maverick Sport MAX. These innovations were unveiled during the company's three-day event in Denver, Colorado, attended by thousands of BRP dealers from all over the world. 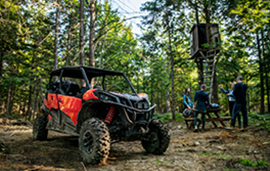 They reaffirm BRP's unshakable commitment to providing as many people possible with exceptional experiences and access to powersports adventures across all landscapes. "We are extremely proud of the products from the 2019 lineup. 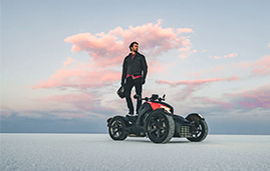 In particular, we know that the Can-Am Ryker will increase the accessibility of 3-wheel vehicles and will open new market segments by allowing people to discover the thrill of riding the open road," says BRP's President and Chief Executive Officer, José Boisjoli. "The 2019 lineup reflects our unwavering dedication to enhancing our riders' experience and adventures. It's an honour to take them with us along for the ride, be it on the open road or on an outing with family and friends, making memories for a lifetime." The Can-Am Ryker is an entirely new model in the Can-Am On-Road vehicle lineup, which now includes both the Can-Am Ryker and Can-Am Spyder model families. The Can-Am Ryker is designed to bring the on-road experience to as many people possible by shattering the accessibility barrier with ease of riding and low purchase price. The Can-Am Ryker is arguably the easiest-to-ride 3-wheel vehicle ever created. It has an automatic transmission so riders don't need to change gears, it's the twist-and-go! "Our research has shown that thousands more people around the world would be willing to consider riding on three wheels if it were more affordable," said Josée Perreault, Senior Vice-President, Can-Am On-Road at BRP. "The Can-Am Ryker tackles that barrier head-on with no compromises – it's highly sophisticated and has a long list of innovative features and technology...plus it looks great and is a hell of a lot of fun to ride!" 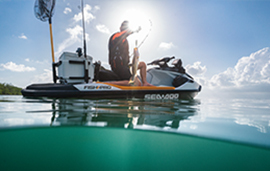 The 2019 Sea-Doo FISH PRO is the first and only true Personal Watercraft (PWC) built specifically from the factory for fishing. The FISH PRO has a long list of innovative features, including a Garmin* Navigation and Fish Finder, making it the ideal watercraft for anglers looking for an unfair advantage when pursuing the ultimate trophy catch in any conditions. "Recreational fishing is one of the top practiced activities in the world," said Bernard Guy, BRP Senior Vice-President, Global Product Strategy. "And while it grows in popularity, more and more people are discovering the benefits of fishing from a PWC. The FISH PRO is a perfect choice, combining the capability they need with the versatility to be used as a recreational watercraft." Among the many benefits the Sea-Doo FISH PRO offers, PWC and fishing enthusiasts will enjoy the ease of access to fishing spots, from shallow freshwater to deep sea offshore, its accessibility, due to its lower purchase price and operating costs in comparison with other fishing vessels, its comfort and stability. "The new Can-Am Maverick Sport MAX vehicle is designed for performance-driving enthusiasts who enjoy conquering off-road challenges alongside their friends and family," said Guy. "We continue to advance Can-Am ownership by equipping our vehicles with functional designs, superior ergonomics and specialty features to stand out against the competition." *Garmin is a trademark of Garmin Ltd. or its subsidiaries and is registered in one or more countries, including the U.S. and Canada. ECHOMAP is a trademark of Garmin Ltd. or its subsidiaries. Ski-Doo, Lynx, Sea-Doo, Evinrude, Rotax, Can-Am, Alumacraft, Manitou, Ryker, Fish Pro, Maverick Sport, and the BRP logo are trademarks of Bombardier Recreational Products Inc. or its affiliates. All other trademarks are the property of their respective owners.